Or, How to Turn a $1,000 Art-Auction Pickup Into a $450 Million Masterpiece. Today, of course, the contents of Lot 664 are worth far more than that: The picture has since sold once for $127.5 million and again, in a record-setting auction at Christie’s, for close to half a billion dollars. 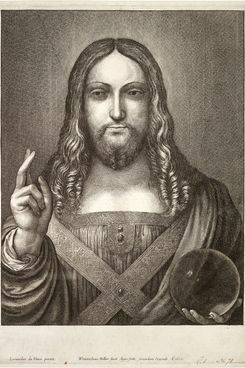 It has been held up as the “male Mona Lisa” and the “Holy Grail of old-master paintings” and derided by this magazine’s art critic, Jerry Saltz, as a “two-dimensional ersatz dashboard Jesus.” It has been owned by a Swiss tycoon, a Russian oligarch, and Saudi royalty. Along the way, it has come to illustrate how the interests of dealers, museums, auction houses, and the global rich can conspire to build a masterpiece out of a painting of patchwork provenance and hotly debated authorship. Its rise is both an astonishing tale of restoration and historical sleuthing and — for those inclined to see the world less romantically — a parable of highbrow greed, P. T. Barnum–style salesmanship, and reputation laundering. But on the day it arrived at Parish’s home in upstate New York, it was still just a painting of unknown origin and questionable condition. Gingerly, the dealer slid the picture from its cardboard container. He noted the gilded frame, likely a 19th-century addition, and the thick layers of paint that had been applied to Christ’s face by a past restorer. Then he placed it back in the box and drove it into Manhattan, where Simon was waiting. The worth of their latest acquisition would be determined by the dealers’ ability to connect it to Leonardo’s inner circle. If the painting was by Luini or another Leonardo disciple, they could expect to get hundreds of thousands of dollars for it. In 1999, a decent period copy now believed to have come from Leonardo’s workshop had gone for $332,500 at auction at Sotheby’s. But before any real attribution efforts could take place, before the dealers could start piecing together the story of the oil painting and its putative author, it would have to be thoroughly restored. “I could recommend a student restorer at NYU,” she said to Simon. “I think this needs a grown-up,” the dealer shot back. Opening her supply cabinet, Modestini produced a vial of acetone and mineral spirits and a cotton swab and conducted a preliminary cleaning of the picture. Two things immediately stuck out to her. One was that the original panel had fissured, resulting in two uneven “steps” near Christ’s face. A previous restorer, Modestini deduced, had attempted to address the problem by inserting a mixture of gesso and glue into the fissure. The second major discovery concerned Christ’s blessing hand. Before bringing the painting to her, Modestini says, Simon had used the infrared lens on his digital camera to take a few photographs of the picture. When he’d examined the resulting images, he had seen a ghostly shape behind the blessing hand. With a few swipes of a solvent-drenched cotton swab, Modestini revealed what she thought might be a trace — or a pentimento, derived from the Italian word for “repent” — of an earlier draft of the painting. 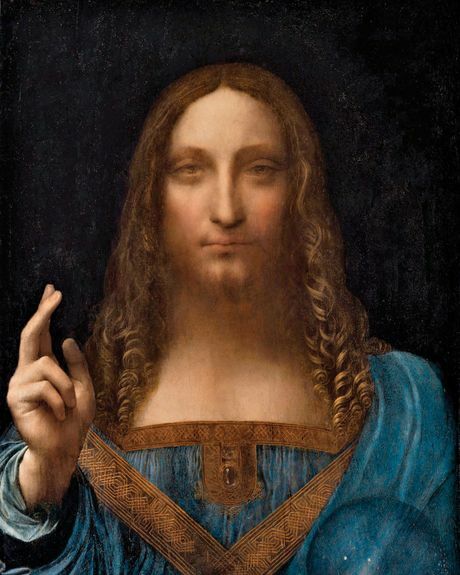 In contrast to the curved digit in the finished work, and to every Renaissance-era replica of the Salvator Mundi Simon was aware of, this thumb appeared to be upright. Modestini was not blind to the significance. “Pentimenti,” she told me, “are in general an indication a painting isn’t a copy, because the copier only observes the surface of a picture, not the skeleton underneath.” In other words, if you’re an imitator without access to an artist’s creative process, you’re going to imitate only what you can see. Still, neither she nor Simon said a word — Modestini for the simple reason that she was unfamiliar with the history of the Salvator, Simon out of prudence. Compared with his peers, Leonardo, an inventor and scientist as well as an artist, was a notably unprolific painter: Fewer than 20 known paintings can be attributed to his hand; the last to be discovered was the so-called Benois Madonna, or Madonna and Child With Flowers, which emerged out of a private collection in St. Petersburg in 1914. As of 2005, two paintings remained unaccounted for: Leda and the Swan, a large-scale mythological allegory, and the Salvator Mundi. If Parish and Simon had somehow managed to stumble upon the latter, they’d be lucky — absurdly so. They’d also find themselves playing an entirely different game than the one they’d set out to play. After all, the bar for a genuine da Vinci would be miles higher than that for a genuine Luini, and clearing it would require time, money, and the support of some of the most powerful brokers in the art world. Modestini concurred that, in the parlance of the industry, the picture had “potential.” She told Simon she’d help restore it, but first it would need the attention of a panel specialist. She suggested Monica Griesbach, a former student of hers. Griesbach, who now lives in Madrid, recalled that her initial reaction to the condition of the painting was trepidation. “The damage, it was considerable,” she told me. The planing was only the start of it. Flipping the picture, Griesbach saw that the original panel was supported by both a cradle and a thick wood auxiliary panel, which was attached to the walnut by marouflage — a now-outdated method involving layers of thick adhesive. When she chiseled off the auxiliary panel, the entire painting came apart in her hands. “In total, there were seven separate pieces,” she said. Worms had tunneled through the wood. “My guess is that the tunneling had occurred before the planing, and when it was planed, the panel became even more fragile and it broke.” Griesbach labored over the painting for six months, reassembling the work using adhesive and tiny slivers of wood to mend the fissures. “And the painting did actually come back together nicely,” she told me. Very few 500-year-old paintings have survived to the present day in perfect condition. “The vast majority,” says Brian Baade of the University of Delaware’s art-conservation department, “have required restoration during their long lifetimes.” Sometimes restoration is just a matter of removing surface coatings that have degraded or darkened. Often it requires more substantial work, including in-painting, which fills in damaged areas. “Conservators,” Baade said, undertake this technique “not to trick the viewer but to reintroduce a sense of coherence and harmony, which is lost when damage remains visible.” And yet restoration, like authentication, is a subjective science. Two hundred years ago, it was common for restorers to overpaint pictures so heavily that the original image all but disappeared; some schools of restoration, particularly in Europe, have advocated a minimalistic approach that allows viewers to distinguish between the original artwork and the in-painting without having to hold a black light to the canvas. In restoring the Salvator Mundi, Modestini, who says she “tries to imitate the original as closely as possible,” would be charged with bringing a badly damaged painting back to life while conserving what remained of the original draftsmanship. And if her efforts on the painting happened to yield insight into its authorship, so much the better. About a year into the restoration process, Modestini was repairing some damage to Christ’s lip when she noticed a set of color transitions that she described to me as “perfect. Just the way the paint was handled — no other artist could have done that.” In 2006, the Louvre had published a book called Mona Lisa: Inside the Painting, which included high-resolution close-ups of the subject’s features. “I was studying her mouth, and all at once, I could no longer hide from the obvious,” Modestini later wrote. “The artist who painted her was the same hand that had painted the Salvator Mundi.” Already Modestini had used intact portions of the painting, such as the corkscrews of hair, to inform her in-painting of destroyed ones. After her epiphany about the authorship, she no longer was just restoring a Renaissance painting — she was restoring a Leonardo. She studied how he had handled certain passages or transitions in analogous works, such as the Mona Lisa and Leonardo’s other masterwork, St. John the Baptist. Her work was almost ontological in nature; by relying on Leonardo’s work to restore the painting, was she uncovering a Leonardo or bringing it into being? 1500: Possibly painted for Louis XII of France. 1625: Acquired through marriage by Charles I of England. 1651: Sold to a mason named John Stone. 1666: Returned to the Crown under Charles II. 1900: Sir Francis Cook acquired a Salvator Mundi. Was it the same one? 1958: Warren E. Kuntz bought Cook’s painting at a London auction. Kuntz gave it to his nephew Basil Clovis Hendry. 2005: Alexander Parish and Robert Simon bought the painting at auction. 2005–6: Restored by Dianne Modestini. 2007: The Met’s Keith Christiansen and art historian Mina Gregori gave it their thumbs-up as a Leonardo. 2008: Sir Nicholas Penny of the National Gallery in London brought scholars together to view the painting. 2010: Warren Adelson came on as a third investor. 2011: The National Gallery included Salvator Mundi in its Leonardo exhibition. 2012: The Dallas Museum of Art put an offer on the painting. 2013: Yves Bouvier purchased the work from Simon, Parish, and Adelson for $83,000,000. 2013: Bouvier immediately flipped the work to Russian oligarch Dmitry Rybolovlev for $127,500,000. 2017: Ahead of its auction, Christie’s showed Salvator Mundi in Hong Kong, London, San Francisco, and New York, where it sold. 2017: Bought by Prince Badr, current minister of Culture, on behalf of the Saudi crown prince. Auction price: $450,300,000. The painting was to go to the Louvre Abu Dhabi but never made it. It missed its scheduled debut in September, and its whereabouts are unknown. Simon held up an image of his pre-restored Salvator Mundi to a black-and-white photograph of Cook’s picture. They were the same, down to that strange “clown’s face” repainting job. His Salvator Mundi was Cook’s. “Kunz” would turn out to be Warren E. Kuntz, who gave it to his nephew, a Baton Rouge sheet-metal baron named Basil Clovis Hendry. It was Hendry’s family who put the painting up for sale after his death in 2004. But before 1900, the painting’s history is much murkier. A painting believed to be the Salvator Mundi is mentioned in an inventory by one of Leonardo’s students in 1525. After that, it disappears, only to reemerge a century or so later, apparently in the possession of Charles I of England. Notoriously tyrannical and equally image-conscious, Charles saw Italian Renaissance art as the ultimate prestige item; he had at least one other Leonardo in his 2,000-piece collection as well as paintings by Titian and Raphael. Charles I was beheaded in 1649, and his collection was sold after his execution to satisfy royal debts. Simon has maintained that it was always his preference that the Salvator Mundi go to a museum, preferably one in the U.S. But he and Parish would not be giving the painting to an institution — neither man was independently wealthy, and the costs to date, from storage to restoration fees, had been substantial. “I did a lot of what I’d call ‘triangulation’ in coming up with a price,” Simon told me. He considered the relevant recent old-master sales as well as the small number of Leonardo works that had gone on sale in the 20th century. In 1989, for example, two Leonardo studies of drapery had each sold for just under $6 million at auction; in 2001, an equally small paper piece had fetched about $11.5 million at Christie’s. Further back, there was the Madonna painting purchased by the Russian czar in 1914 for what would be hundreds of millions today. But there were X factors, too: The art market was the biggest it had ever been, spurred by a new generation of deep-pocketed foreign investors who had come to see it as a safe place to park their cash (or, as numerous reports have demonstrated, to hide misbegotten gains). Rare art was also a status purchase, offering far more reputational sheen than, say, a Bugatti sports car or an island in the Caribbean. And no art trophy was going to be bigger than a Leonardo. Da Vinci’s appeal, Simon told me, “is broad. It goes beyond the art collector or the museum. He’s treasured by everyone. He’s a different animal.” The buyer wouldn’t just own a painting; he’d have a claim to the patrimony of Western civilization. The asking price, the painting’s owners would later decide, should be no less than $100 million. But first the art world would have to accept the painting’s origin story. As early as 2006, the National Gallery in London had been throwing around the idea of a big Leonardo show tied to a new restoration of the museum’s major da Vinci painting, The Virgin of the Rocks. The show had been approved by Charles Saumarez Smith, then the museum’s director, but it would be left to Sir Nicholas Penny, Smith’s successor, to execute. Penny knew of the Salvator Mundi — he’d seen the painting at Simon’s gallery on a business trip to New York. Including a never-before-seen Leonardo in the show would be a major coup for the new director. Penny suggested that Simon bring the painting to London for a side-by-side comparison with The Virgin of the Rocks. In a March 5 email to experts, Penny wrote that he and the National Gallery’s head of research, Luke Syson, along with “our colleagues in both painting and drawings in the Met,” were convinced that Simon’s Salvator was the Leonardo original. Still, he went on, “some of us consider that there may be [parts] which are by the workshop.” Included on the list of recipients was Martin Kemp, a research professor emeritus at Oxford and the author of several books on Leonardo. In May 2008, Kemp and the other experts were led through the staff entrance of the National Gallery and into the museum’s main conservation studio. Simon had flown to London in business class with the Salvator Mundi a few rows away in the coat closet. As promised, the staff had removed The Virgin of the Rocks from the galleries and placed it on a stand next to the Salvator Mundi. Others have aired plausible guesses about the true identity of the painter. “My view is that Leonardo produced the preparatory drawings; he and assistants expanded these studies on a cartoon and pounced it for transfer,” Matthew Landrus of Oxford University told me, referring to a kind of tracing technique often employed by Renaissance-era artists. Landrus believes the painting’s author is Bernardino Luini, the same artist that initially occurred to Parish. In 2011, Simon took the Salvator Mundi back to London, this time with the painting traveling in the plane’s cargo hold in a custom crate designed to insulate it from damage. By the time “Leonardo da Vinci: Painter at the Court of Milan” opened in November 2011, the National Gallery had sold out most of the tickets. In January, the museum pushed back its closing time until 10 p.m. in order to accommodate additional patrons. 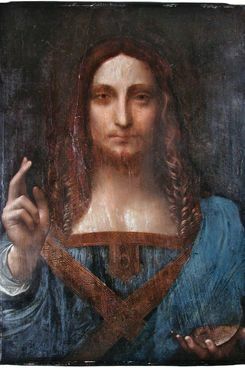 A condition of Simon and Parish’s loan of the Salvator Mundi to the National Gallery was that the painting not be actively on sale, or “in the trade,” in art-world parlance. Still, it escaped the attention of no one in the art world that the Salvator Mundi would be the only painting in Syson’s upcoming exhibition to be privately owned, and by a consortium of dealers at that. (In late 2010, Simon and Parish had recruited a third partner, the Manhattan old-master dealer Warren Adelson, to help defray costs related to storage and insurance.) Its mere presence in the show would add millions of dollars to its value. In retrospect, it almost certainly was. A few months before the show’s opening, Maxwell Anderson, the incoming head of the Dallas Museum of Art, arranged to see the Salvator Mundi in New York: If it was a Leonardo, it would be the perfect big-budget acquisition with which to start his tenure in Texas. Standing in front of the painting, “I was totally smitten,” Anderson recalled. He asked Simon whether other museum heads had been given an opportunity to purchase the painting. “Robert wasn’t interested in sharing that information,” Anderson told me. “And I didn’t press him. Dealers tend to take confidentiality as seriously as any psychiatrist.” Why they do so is not only a matter of privacy: If an artwork is seen multiple times by experienced buyers but not actually purchased — or, more commonly, if it goes to auction but fails to fetch even its reserve — a stigma becomes attached to it. Buyers get skittish: Did other people, with more practiced eyes, see something they didn’t? It becomes “burned,” its value severely diminished. In fact, according to multiple sources, in 2008 and 2009, both the Museum of Fine Arts in Boston and the Metropolitan Museum of Art in New York had viewed the painting and declined to pursue an acquisition. Both institutions accepted the age of the painting and the connection to Leonardo, but given how much restoration work had been put into bringing the painting back to life, they balked at the $100 million price tag. In March, Anderson stood up at a board meeting and showed a slide of the Salvator Mundi. “You could hear a pin drop,” he remembered. “The room was fascinated. You started to get all this energy about what we might be able to do.” Soon, he and Deedie Rose, the doyenne of Dallas philanthropists, were paying visits to dozens of deep-pocketed collectors and donors, waxing poetic on the upside for the museum and for Dallas as a whole: increased ticket revenue, more media attention, a sense of civic pride at being one of only two American museums to own a Leonardo painting. “We were methodical,” Anderson told me. “We concentrated on the kind of individual who thought the city deserved the best and who would be able to give a million-dollar pledge on the painting.” But ultimately the museum couldn’t come close to the $100 million asking price and talks collapsed. The negotiations left Simon, Parish, and Adelson exasperated. “It had been a long road,” Parish told me. “Eight years long. We were out of pocket on all these costs. It was time the painting got run up the flagpole” — time to explore the possibility of a private sale. The audience for such a sale was limited. 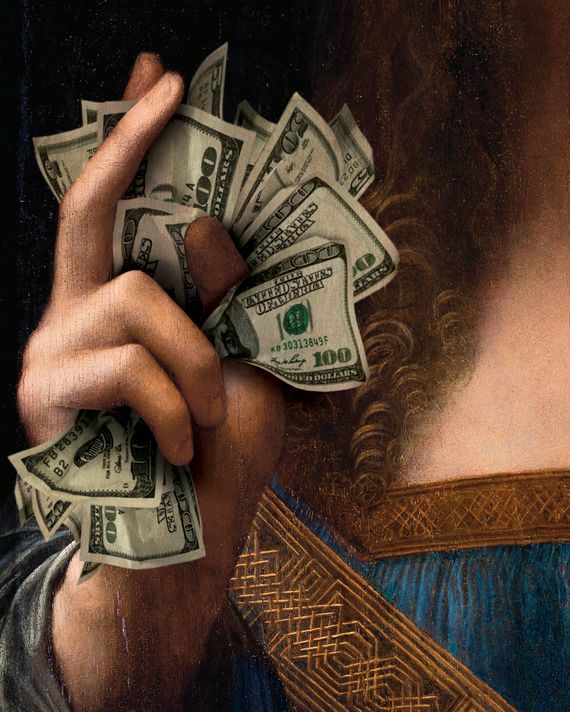 Although there were a few dozen buyers who might be able to purchase a $100 million painting, there were far fewer who would be willing to spend $100 million on a heavily restored probable Leonardo. 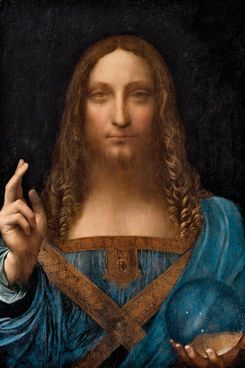 One such buyer, a multibillionaire Russian oligarch named Dmitry Rybolovlev, was staying in his daughter’s $88 million apartment at 15 Central Park West, a short drive away from the gallery where the Salvator Mundi was being stored. A mining-ore baron, Rybolovlev seemed to attract controversy wherever he went. He’d been jailed and tried for the murder of an archrival (he was eventually acquitted). His efforts to hide money and assets from his ex-wife were held up in the Panama Papers exposé as “a textbook example of the lengths rich people (in most cases, men) go to protect their considerable wealth in case of a marital breakup.” In 2008, he bought Donald Trump’s Palm Beach estate for $95 million, a markup of $50 million and an investment that earned him a place in the Russiagate orbit. 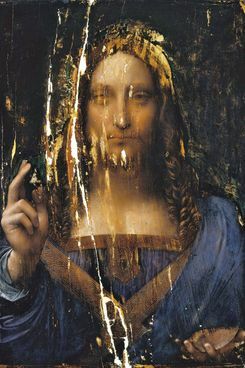 According to a person with firsthand knowledge of the situation, in early 2013, Rybolovlev began exploring the possibility of purchasing the Salvator Mundi for his growing art collection. For assistance, he turned to the Swiss dealer Yves Bouvier, who had previously accumulated a number of high-value artworks on his client’s behalf, including four Picassos and a Modigliani sculpture worth $60 million. From his home in Singapore, Bouvier conducted some preliminary due diligence on the Salvator. It was a “nice” painting, he concluded, and worth purchasing, within reason. “I said to Dmitry, ‘This is a real Leonardo but a small part is the original part, and you have to be careful,’ ” Bouvier told me. “I did not want to give him my personal guarantee on this painting. I said, ‘If you like it, I will get it for you, but you need to buy it only because it is personally interesting to you as a decorative painting.’ ” Bouvier was in part calibrating his own risk in the deal: He thought there was a chance that the painting, if Rybolovlev ever tried to flip it, wouldn’t hold up to scrutiny. On March 20, 2013, Bouvier contacted Sotheby’s, which would act as intermediary in the sale and protect both buyer and sellers if things went south. The same day, the Swiss dealer wired $63 million to Sotheby’s, and on March 22, he flew from Singapore to New York. At the Sotheby’s offices, Bouvier explained that he wanted to show the painting to an acquaintance to see what they thought of it. He did not specify the identity of this third party, and Sotheby’s has subsequently claimed it did not ask. The painting was already on the premises; if Bouvier was ready, a staff member could place it in a carrying case and accompany the dealer to his friend’s apartment. In Rybolovlev’s penthouse, the oligarch and the dealer retired to the living room, dozens of floors above Central Park. Bouvier says a young woman, possibly a girlfriend, translated for Rybolovlev. (Rybolovlev doesn’t speak English, and Bouvier has no Russian.) Bouvier had not told Rybolovlev he would be bringing along the painting; now, with a flourish, he removed it from the carrying case. “It’s so beautiful,” the Russian said. Bouvier reiterated his warning about the authorship of the painting. “I said, ‘You’re sure you want to buy this?’ ” he recalled. “He said, ‘Yes, yes, I am sure.’ ” According to Bouvier, a deal was struck on the spot. He would acquire the painting for Rybolovlev for $127.5 million. What Bouvier did not disclose, Rybolovlev would later claim, is that Simon and his partners were selling it for only $80 million; more than that, Rybolovlev’s lawyers have said in a suit, Bouvier actively barred his client from speaking to the sellers and manufactured fake negotiations intended to give Rybolovlev the impression that he was getting the best possible price for the Salvator Mundi. (Bouvier disputes Rybolovlev’s account.) In the coming weeks, Bouvier wired an additional $20 million to Sotheby’s, bringing the total price to $83 million, $3 million of which belonged to the auction house for brokering the transaction. Then, on May 15, Bouvier sold Rybolovlev the painting. Simon, Adelson, and Parish would also end up frustrated with the transaction. They had no idea their painting would be immediately sold at a higher price to a different buyer. When Sotheby’s caught wind of their dissatisfaction, the auction house filed preemptively in federal court to block a potential suit. In a statement, it said it had not been aware of Bouvier’s plans and accused the dealers of “experiencing seller’s remorse.” Simon, Adelson, and Parish are prevented by a nondisclosure agreement from discussing the dispute. But according to someone with knowledge of the situation, a lawsuit was never filed; instead, Sotheby’s and the dealers settled quietly. His words proved prophetic. On the evening of November 15, a swarm of art-world luminaries and celebrities streamed into Christie’s headquarters in Rockefeller Center, where potential bidders on the Salvator were handed specially made red paddles. An image of the painting against a blue background smiled back at attendees. Within a few minutes, bidding had far exceeded the $100 million reserve and rocketed to $200 million, then $280 million. Less than 20 minutes after the auction for Lot 9B had commenced came the bang of the gavel at $400 million, with another $50 million going to the auction house — by hundreds of millions the most ever paid for an artwork at auction. More recently, rumors have emerged of an even more complicated scenario: Saudi Arabia and Abu Dhabi, the Daily Mail has reported, bid against each other in the Christie’s auction, both under the incorrect assumption that they were competing with Qatar, an opposing regional power, for the picture. But the auction house told me that, past the $230 million mark, there were just two bidders, and only one of them was bidding on behalf of a client in the Middle East. The other, Christie’s says, came “from another part of the world.” According to someone with firsthand knowledge of the situation, that second bidder was the Chinese billionaire Liu Yiqian, who wanted the painting for his new museum in Shanghai, though Liu has publicly denied it. According to several people with knowledge of the situation, the most plausible explanation is also the most straightforward. 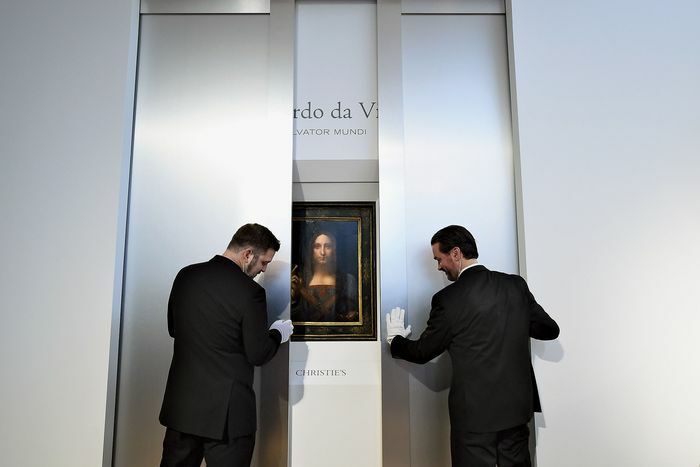 For the time being, the Salvator Mundi remains in a Switzerland free port — a kind of tax-free haven — while Crown Prince Mohammed bin Salman mulls whether he wants to move forward with the gift or keep the painting for himself. “The Saudis are really trying to build their own tourism industry, and this would be a big tourist attraction,” one source told me. For a ruler wrapped up in an international controversy over the murder of the Saudi dissident journalist Jamal Khashoggi, this would make a good deal of sense — MBS would be just another in a long line of owners who used the painting as a way to spruce up his image.